In 2014 we bought one Silver Fox buck and two New Zealand does to start our backyard meat rabbit herd. You can read my reviews of the parents under their own breeds; he's Sky, she’s Jael. The parents were pellet-raised, but we transitioned them to natural feed—greens and twigs grown and gathered on our farm, supplemented with root crops and some whole grain. 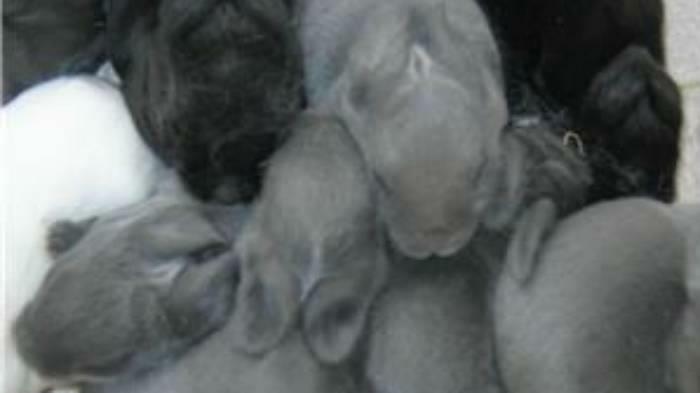 (For more on natural feeding visit rabbittalk.com) One doe had smaller and less healthy litters on the new diet. The other throve. We kept her kits, and now we are breeding her children and grandchildren. I’ve liked the crossbreds better than their purebred parents. They’re meatier than their Silver Fox sire, and their hair isn’t quite so thick as his, which makes it a bit easier to clean their cages. They’re calmer than their New Zealand mother. All of them do well on natural feed. They breed reliably and have litters of 8-10 kits, healthy and thriving except for the occasional runt. We’ve occasionally had ‘nest box eye’ in the worst weather, but a few applications of ointment have cleared that right up. We’ve had an interesting mix of colors. We bred a gray buck to white does and got black kits; then we bred a gray buck to the black does and got black, white and gray kits, some with the ‘gold-tipped steel’ pattern to liven up their coats.